What's a summer without sports themed cakes. For you sports fans out there, stay tuned because we will be sharing some of our newest sculpted sports cakes on the blog. This sculpted softball glove and ball was made for a high school graduation party earlier this month. Our client ordered a surprise softball cake for her daughter Lindsey who loves to play softball and will continue to play in college. She requested a yellow softball instead of the classic white, which made for a striking contrast in the glove. While the look of the cake was leather and earthy, the inside flavor of the cake was Guava Lava, pretty pink, sweetly fruity and absolutely delicious! 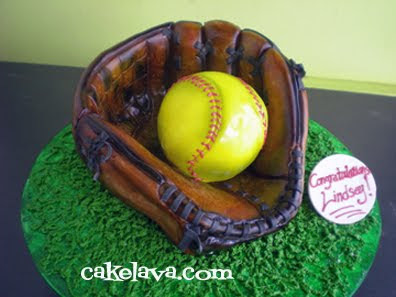 Thank you soooo very much for the fabulous softball & glove guava cake!!! This was a surprise for Lindsey so she was in a state of awe when she saw the cake. She loved it and almost didn't want to cut it! But, when it did get cut, she wanted to be the one to cut it, no one else!!! Everyone was amazed by the cake. Our cousin's daughter, who is 10, had written a school paper on your bakery and cake challenges so she was really thrilled to have the chance to see a design and get to taste it as well. 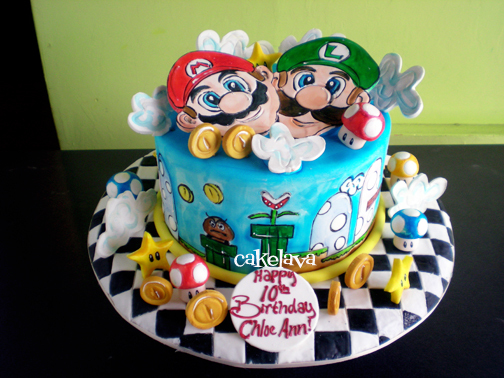 Certain themes, like Super Mario Brothers, are made for cake. The characters are cute and colorful and the whimsical nature of the game expresses itself well in cake. For Chloe Ann's 10th birthday, her mother asked Rick to design a cake in the Super Mario Brother's theme. She wanted both Mario and Luigi on the cake and otherwise left the rest up to Rick. He used a combination of artistic techniques and everything was hand crafted. This was a super fun cake to make and it brightened our day to see the smile on her mother's face when she picked up her cake. She knew Chloe Ann would love it, and that made us very happy. Score! It was one week ago today that Rick and I were in Orlando, Florida, getting ready to meet our families for dinner at Portobello Restaurant in Downtown Disney. We had originally planned for the night to be a family reunion, a chance for members from both of our families who live all over the country, to catch up with each other. Then it turned into something more. I thought about the fact that August 26th was Rick's birthday and this would be the perfect opportunity for all of us to celebrate his birthday together. I asked everyone to keep it a secret and set out to find a cake artist to make a very special cake for my sweetie. I have been blessed for nearly a decade to have an amazing custom cake made by Rick on my birthday, but he has never had a special cake made for him. Over the years we have ordered ice cream cakes, which he loves, or special desserts where we are dining, but never a custom made cake. I always knew one of these years I would contact a cake designer to make Rick a cake, I just didn't know who or where it would be. 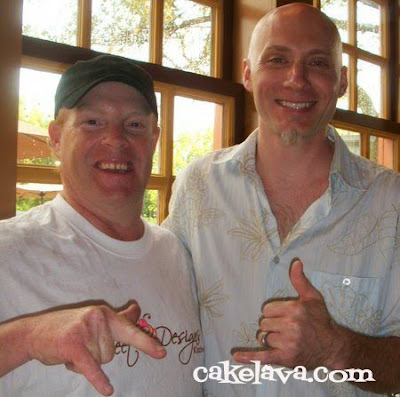 Eric Woller of Sweet Designs Kitchen immediately came to mind. 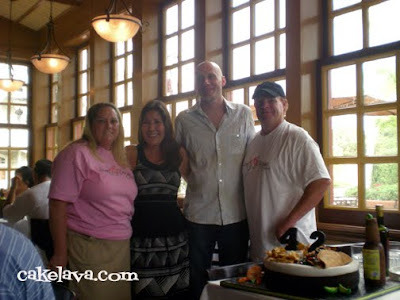 Eric and his wife Patty recently opened Sweet Designs Kitchen in Orlando. 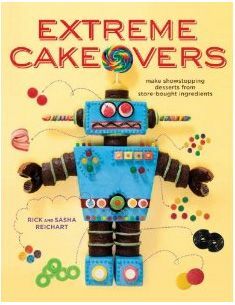 Eric and I have never met but I was familiar with his work on TLC's Ultimate Cake Off, and noticed the guy can sculpt! I knew I wanted Rick to have a sculpted cake and had a couple of ideas that I presented to Eric. Little did I know what kind of reaction I was going to get when I contacted Eric. The man was excited, no, ecstatic, about the prospect of making a cake for Rick. He said he has great admiration for Rick's work and would be honored to make his birthday cake. I knew right away that between Eric's abilities, his kindness and his desire to make Rick's birthday cake, that it was indeed, the perfect match! 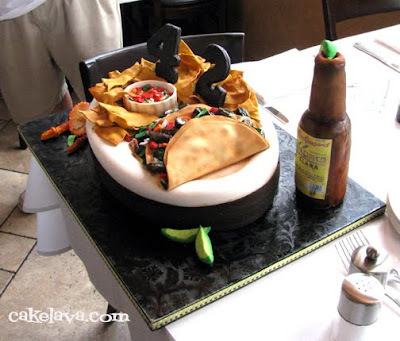 I told Eric that I wanted a sculpted plate of carne asada tacos with chips and salsa and a bottle of Pacifico. 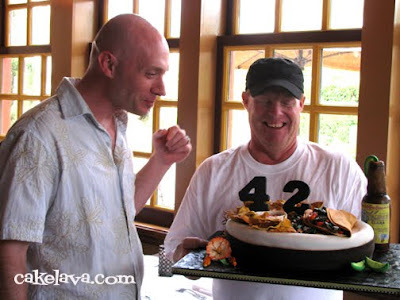 This is one of Rick's favorite meals and he has tried, with no success, to find carne asada tacos as good as what we remember in L.A. and cannot find them here anywhere. 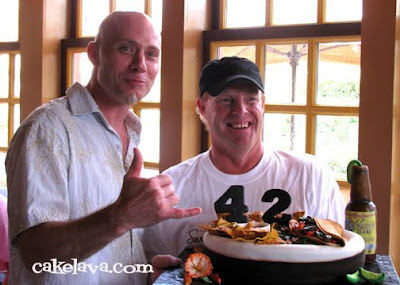 We've tried nearly every Mexican restaurant/taqueria on Oahu and they just don't compare. Ironically, in order for Rick to enjoy a good plate of carne asada tacos like we had in L.A., we would have to go to Orlando to get them! Rick and I, our families and the staff and diners at Portobello restaurant were blown away when Eric and Patty walked in with the cake! Rick had no idea we were celebrating his birthday or that he was getting a cake, much less a cake as fabulous as the carne asada tacos plate! The level of detail was incredible and Rick was speechless when he saw it. The funny thing was I couldn't tell who was more excited, Rick, in receiving the cake, or Eric presenting it to Rick, and that made the moment even more magical, knowing how happy this cake made them both. After the cake was presented, Rick and I were thrilled to meet Eric and Patty, and everyone was grinning from ear to ear. It was a night we will never forget! BIG thanks to our new friends Eric and Patty for making the cake. We can't think of a better, more "Magical" way for us to meet than at Disney with Rick's birthday cake! Mahalo to the Reicharts' for sending us the photos from this very special night! another view of the fabulous cake! Four and A Half Foot Stunner! We just returned from a fun-filled week in Florida! Having been absent from the blog for over a week, we knew upon returning we were going to go BIG -- and Linh and Roger's towering four and a half foot ivory and platinum wedding cake would be perfect! Linh and Roger were married a little over a month ago at the iconic Royal Hawaiian Hotel (the Pink Hotel) on Waikiki Beach, in the Monarch Room, a huge ballroom with a pink interior. The fabulous Yvonne Design team of floral and lighting designers completely transformed the Monarch Room over the course of two days from pink to white at the couple's request. They used over 2000 yards of ribbon and 200 phalaenopsis orchids for the installation behind the head table. Flowers and real crystals were found abundantly throughout the room and it was without a doubt, one of the most blinged out events we have ever done! For this platinum wedding, Linh and Roger wanted a BIG cake that would cause all their guests jaws to drop and would be a key focal point at the wedding. Rick took his design duties very seriously, to assure their cake would be worthy of talking about for years to come. Colors would be limited to ivory and silver. It would be several feet tall, with large amounts of handcrafted flowers, romantic swirl detailing and drapery and a fair amount of bling. Rick spent a couple days making all the ivory flowers by hand, custom small brooches for the draping, and creating the pole apparatus for the top tiers to sit upon. This was a cake that required meticulous advance planning both in the making of the cake and in the on-site set up. Upon arriving at the Royal Hawaiian Hotel, we were met by Alex Garcia of Yvonne Design and one of his assistants who came out to help us transport the cake. We didn't know he would be there and we were so touched by their kindness. Rick and Alex transported the wedding cake to the large table that was exquisitely covered with Les Saisons custom linen. Rick carefully assembled the cake and as the cake "grew" so did the crowd watching him. No pressure on Rick of course! He was concentrating so intensely it didn't seem to phase him, or maybe that is how it appeared. The crystals dangling from the tier were placed ever so gently as was each piece until "The Reveal", which was absolutely gorgeous! We couldn't be happier. 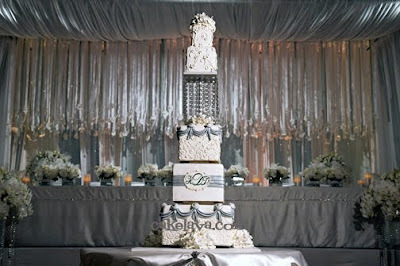 The cake matched perfectly with the amazing backdrop and the rest of the stunning decor in the room. 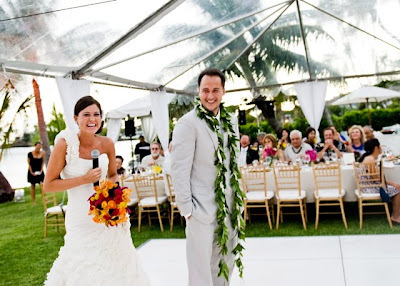 It was an incredible team of vendors and one of the most extravagant weddings at the Royal Hawaiian Hotel. We want to thank everyone who contributed to an unforgettable wedding and to Yvonne Design and VISIONARI for sharing the images with us! All white cakes aren't a regularly requested design for us, and when they do come our way we want them to have just as much of an impact as our bolder, more colorful cakes. Our bride Chelsea who was married last week in an outdoor wedding at Lanikuhonua, requested an elegant all-white wedding cake with gardenias. Rick spent several days making the large delicate gardenias by hand. 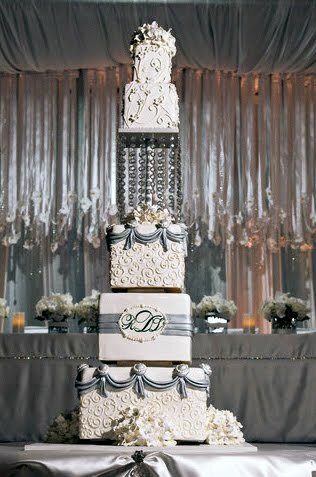 He added thin white bands at the base of each tier and added some pearlescence to the cake that would complement the hanging crystals at the reception. Chelsea and Gerald's wedding cake was beautiful in its simplicity, and the flowers looked right at home with the gardenias and phalaenopsis orchids used throughout the wedding. 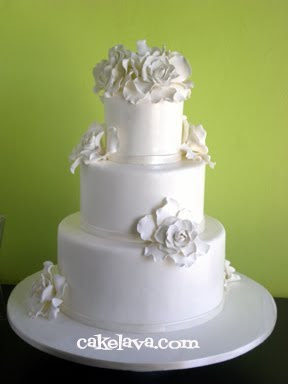 There is nothing more intoxicating than the smell of fresh gardenias, although our Hawaii Five-0 and Guava Lava flavors, which the couple chose may be a close second. Congratulations to Chelsea and Gerald! 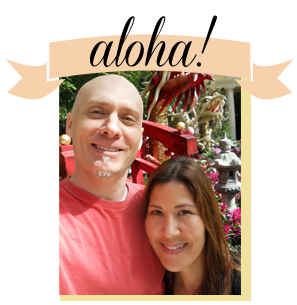 Our bride Eileen and her fiance flew all the way from Anchorage, Alaska to Oahu to celebrate their pretty pink wedding last weekend. It was clear when we walked into the reception room that Eileen adored the color pink -- beautiful big pink and white floral centerpieces, pink and black bridesmaids dresses, and a pearly pink wedding cake. Rick designed the four tier wedding cake, drawing inspiration from the bridesmaids dresses which had a delicate lace pattern and ribbon detailing. 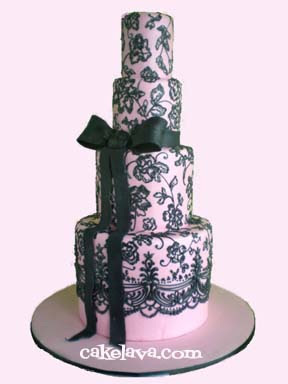 I love the way the ribbon cascades down the cake, drawing the eye all the way down the cake, ending near the edge of a gorgeous delicate edge of lace. As luck would have it, we got to see our bride Eileen and she practically gasped when she saw her cake. I wish we had snapped a photo of her sitting at the head table, which was lit from underneath and gorgeously decorated by Yvonne design, smiling as she looked around admiring her wedding reception room. That was one satisfied bride! The Hulk Goes Incredible, Again! 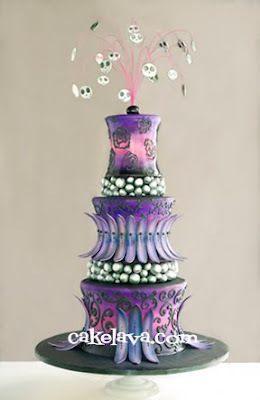 We had some fabulous cakes to make over the weekend, and one Incredible cake! 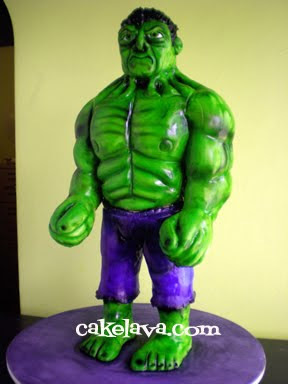 This was Rick's second standing up sculpted cake of The Hulk and it was just as massive as the first one. Combined with a number of wedding cakes we made, we're still recouperating from the weekend! 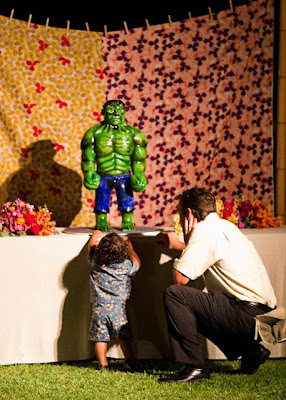 Our bride Jana ordered The Hulk cake as a surprise for her fiance at the wedding. 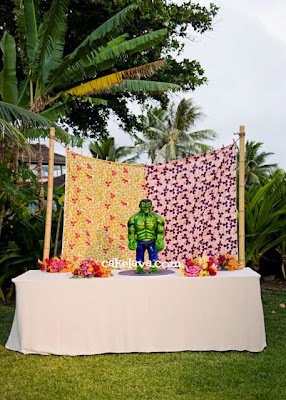 The almost 3 foot tall Lemon Pucker cake was delivered just before the groom had a chance to see it, while the couple was cleverly whisked away to take sunset photos with their photographer Christie Pham. Kudos to their coordinator Christina from Pacific Aisles who had come up with the plan to occupy the groom while we secretly brought in the cake. The cake was placed on a table with a floral backdrop behind it, uniting both the masculine with the feminine and also made a nice separation with the abundant tropical green plants behind it. We love that The Hulk was surrounded by beautiful floral bouquets. It was a gorgeous wedding and always fun to be included in such an important surprise! Special thanks to Christie Pham Photography for sharing with us these awesome images from the wedding! We really enjoyed seeing the expressions of our bride and groom and their guests enjoying the cake. Andrea and I would like to thank you for everything you did. Our wedding cake was far beyond what we were expecting....not like we thought you weren't going to WOW everybody, but it completely blew EVERYBODY away! Congratulations to Andrea and Christian! Thank you for bringing us an inspiring theme and colors to work with. A Big Thank You also to Rachel Robertson Photography for her AMAZING images! 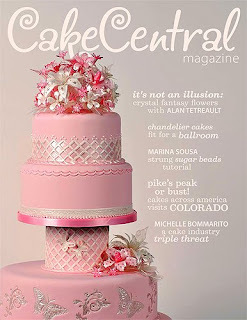 Watch for more of Rick Reichart's newest designs in upcoming issues of Cake Central Magazine! Happy Friday Everyone! Fun loving Elmo is an appropriate character for any day of the week, but he works especially well for a post on Friday, when we're all thinking about our weekend and how much fun we plan to have. For those of you who are working all weekend, like us, we hope this cute Elmo cake will put a great big silly grin on your face and put you in a festive mood. 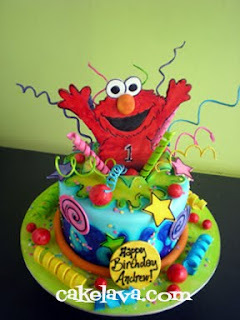 Fun, colorful and festive is exactly the vibe Rick was going for when he designed this Elmo cake for Andrew's birthday. In person it looked like Elmo was leaping out of the brightly colored cake ready to celebrate. It was absolutely adorable! Judging by the big smile on his mother's face when she came to pick up the cake, we're guessing Elmo was the life of the party! In late June we announced that Rick Reichart would be making his teaching debut at Icing Inspirations in Kitchener, Ontario, Canada in March of 2011. Four days later, the first class sold out and a wait list was in effect. At the end of July, a second class was announced and students signed up. The 3-day class is called "Discover Your Inner Artist" and Rick will be teaching his students some of his favorite cake design techniques learned in his nearly 20 years of making cakes, including painting, airbrushing, sculpting and freehand art techniques all without the use of special cutters or molds. 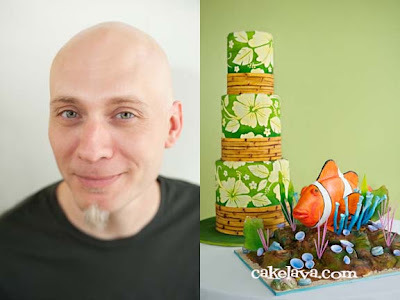 Rick will demonstrate his hibiscus wedding cake with bamboo, a cakelava signature style, and a sculpted clownfish in a coral reef composition. This will be Rick's first visit to the Toronto area and we both can't wait to experience Canada! In the past week a number of people have mentioned to us they wished they could take Rick's class but it was sold out already. We informed them there was a second class that they could register for, which they were happy to hear. We felt it was important to provide information on Rick's SECOND class for those people who have missed it and want the opportunity to learn from him. The information is below. We do not know how many spaces are left but the registration is open presently. Icing Inspirations is accepting a maximum of 15 students per class and is requesting the student to have confidence when working with fondant. Registration and class information here. For those of you travelling to attend the class, please contact Icing Inspirations at info@icinginspirations.ca for information on accommodations or any questions about the class. The first class is scheduled on Thursday through Saturday and for his second class, Rick is making a middle of the week class available for those whose schedule cannot accommodate a weekend class. We would like to take a moment to acknowledge those who have contacted us for weddings and events during this time and have been turned away. We thank you for your understanding and support. The Force was definitely with Rick last week, as all the stars in the galaxy lined up and granted him one of his cake wishes -- to make a full body STAR WARS Yoda cake. Rick has been wanting to make a Yoda cake for a while. He's come close a number of times, until someone decides they would rather have a different figure, or the Millennium Falcon. He's made numerous Millennium Falcons, R2-D2's and the Death Star. He also made a cupcake tower with handcrafted Star Wars figurines back in the days when we were crazy enough to do it. If you want to see tireless dedication to one's craft, there is no finer example than a Star Wars cupcake tower with a sculpted Death Star on top! The common link in each of Rick's Star Wars cakes is that they were all made for men, or in some cases, young boys, like Dean, an absolutely adorable 6-year old Star Wars fanatic whose favorite characters are Luke Skywalker and Yoda. When we heard from his mother that Dean was having a Star Wars themed birthday party and loved Yoda as much as Rick, we knew it was a match made in intergalatic heaven! Dean could have the cake of his dreams and Rick could fulfill his geeky cake fantasy. 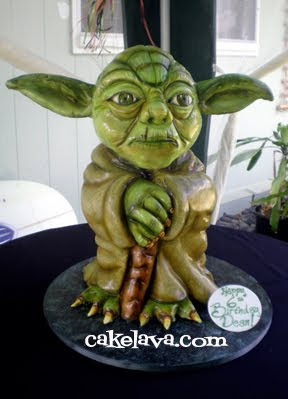 This yoda cake, our newest Star Wars challenge, easily goes on the list of "Cakes We Wish We Had Growing Up", and also one of our favorite Star Wars cakes in our collection! Our calendar is full of weddings this week and next and romance is in the air! Pretty handcrafted flowers are currently being made in our kitchen along with other custom pieces that will adorn our couples' wedding cakes. Being that we are surrounded by love and romance for the next couple weeks, I thought it would be fun to share one of our recent cakes, a Tiffany blue gift box with a silver link bracelet and heart charm. The cake was ordered by our client in honor of his girlfriend's birthday. 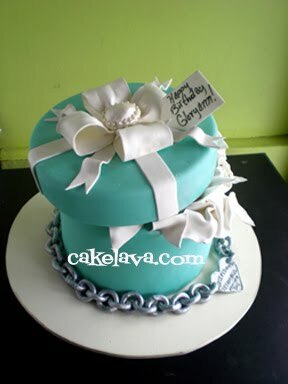 Just as he had given her his heart, he also gifted her with a "Return to Tiffany" charm bracelet, which he requested to be included on the cake. The Tiffany colored box with the charm bracelet made for a beautiful composition and a classic expression of love which no doubt swept her off her feet!